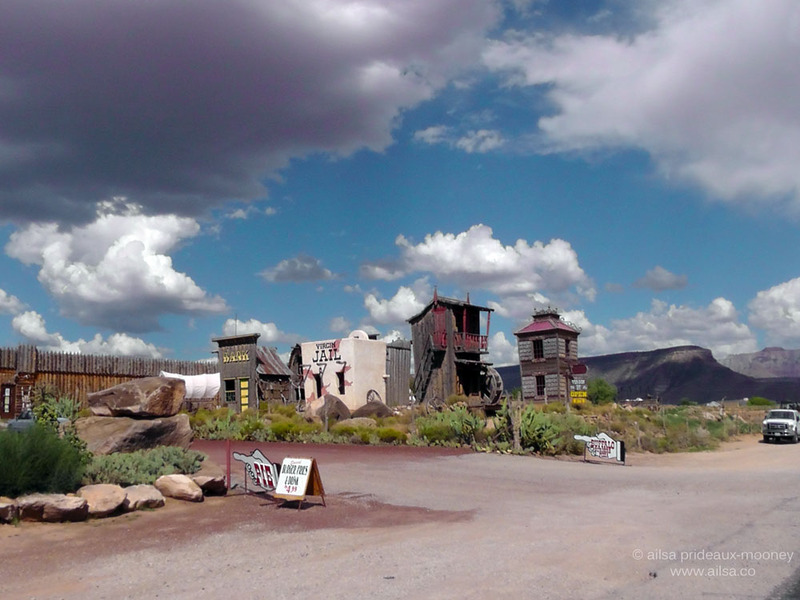 US Road Trip Day 17.2 – Giant Chefs and Virgin Jails | Where's my backpack? Still on a high from our visit to Zion National Park, we set off once more, past dazzling striated plateaux and gathering storm clouds. This time we were on a mission; we weren’t going to stop until we reached St. George and we stayed true to our word until we spotted the oddest looking tree by the side of the road, covered in shoes and boots. Rumour has it that hikers would come here upon completion of the arduous Angels Landing hike in Zion National Park, because the hike was so terrifying and the views so spectacular, nothing could top it, so they might as well hang up their hiking boots. I had no idea when I was photographing the shoe tree that I was photographing history; on November 15th after our visit the tree was set on fire by person or persons unknown and is no more. I also had no idea at the time that we were driving through a town called Virgin, which made for an interesting discussion when we passed a row of ramshackle buildings straight out of a cartoon and spotted a shack labelled Virgin Jail. 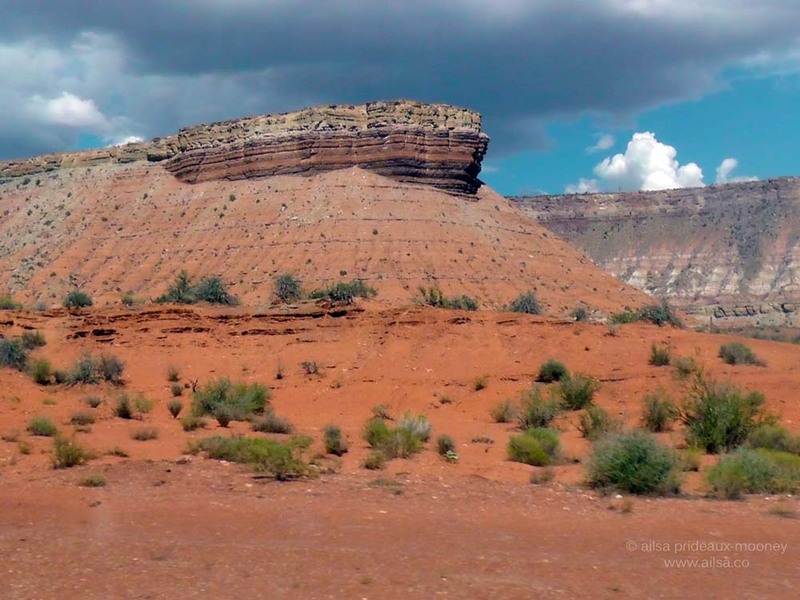 We sped on towards St. George in search of the Jiffy Lube and found it without much ado. Pulling into the empty parking lot, the shop looked strangely quiet so we drove up to the door and stared at the dark interior. The hours were printed in bold letters on the door; Mon – Sat 8am – 6pm. “I don’t understand it” Jill said, perplexed. “We can’t have spent that much time in Zion.” I pointed to the bottom line. Sun – CLOSED. “I don’t suppose, by any chance, today is Sunday?” I asked and we burst out into helpless laughter. We had been on the road so long, days of the week had become redundant…until we needed to get work done on the truck. There was a Starbucks nearby so we piled in with our laptops, ordered up two vats of coffee and sat there trying to come up with a plan. There was no way we were going to try crossing the desert without having the truck looked at, so the obvious decision was to stop in Las Vegas for the night. Jill started looking at camp sites while I checked the weather – it was supposed to be 109F, nearly 43C. I started crying on the inside; would it be too much to ask for a tent with air conditioning? Jill wasn’t having much luck with sites; there was a KOA in the parking lot of the Circus Circus Casino that was really only for RVs; there was no shade anywhere and the site was one big dust bowl. She found another that looked more promising just out of town, but there were warnings to watch out for broken glass and a scary sign with a jagged broken bottle sticking out of the sand. I stared at that sign and something inside me broke. 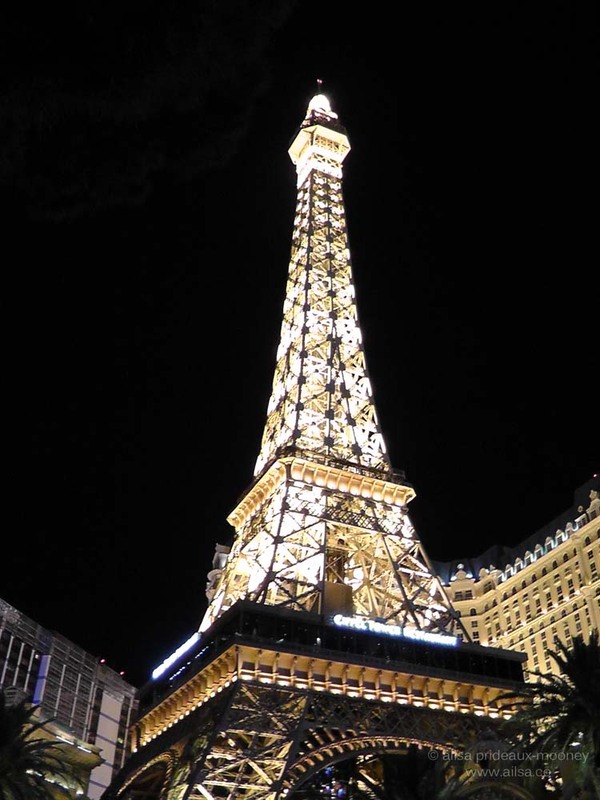 Without a word, I ran a search on cheap hotel rooms and found one for $24 just off the strip. “Hey Jill, for a couple of dollars more we could get a hotel.” “Oh, thank God, I didn’t want to be the first to suggest it” Jill sighed in relief and we phoned in a reservation. I was so happy I could have wept. Real beds, a bathtub, no savage ants. That reminded me to grab the first aid kit out of the back and smear ointment on my poor stung feet; they felt better almost immediately. 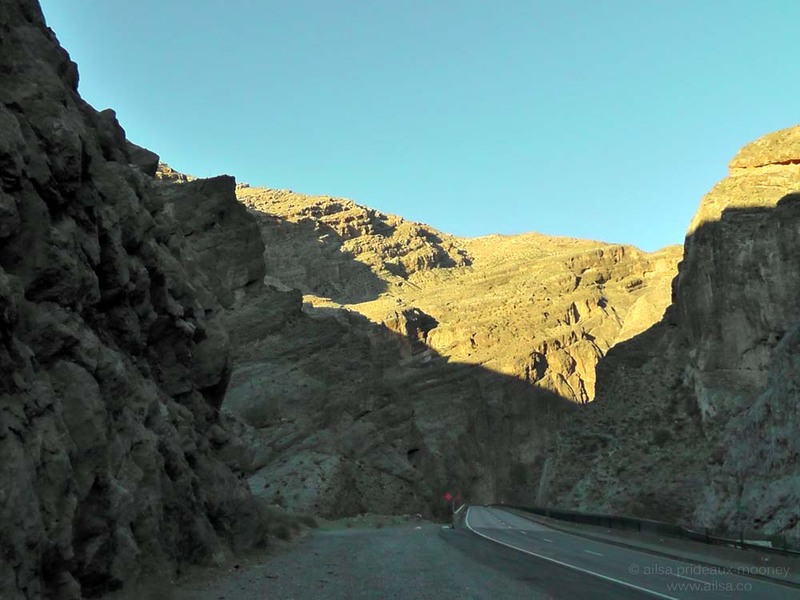 Minutes out of St. George we slipped across the Arizona border and were soon driving along a spectacular 13 mile stretch of the I-15 freeway that runs right through the Virgin River Gorge. 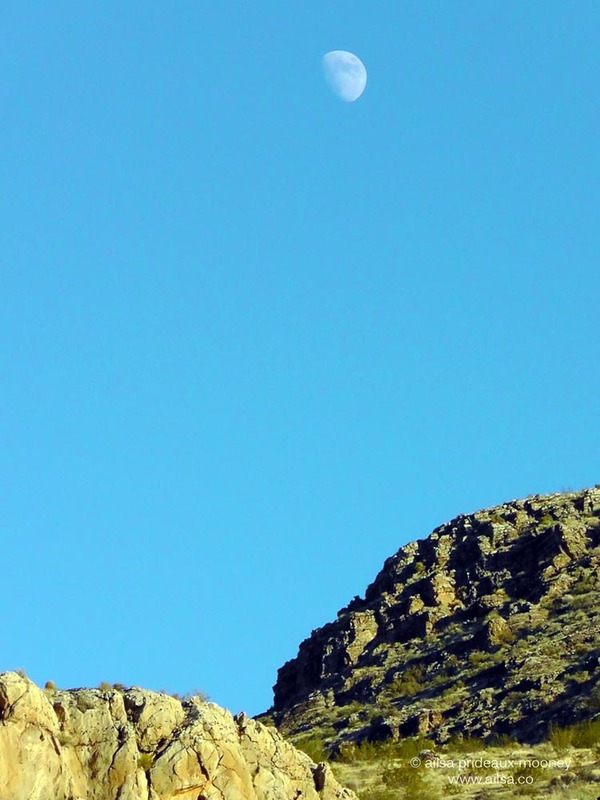 The moon was already high in the sky when we entered the gorge but we weren’t in any rush now, so meandered through leisurely, marvelling at the scenery. The sun was beginning to set by the time we emerged into the Arizona desert, now painted heather and ochre by the dying rays of light. 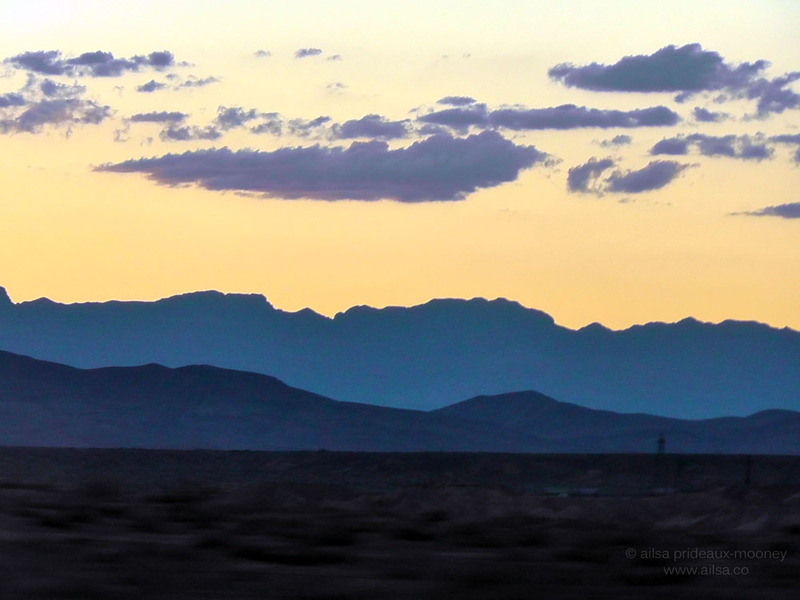 Fifteen minutes later we ended our brief journey through Arizona and crossed into Nevada where we were treated to a resplendent sunset over the Mormon Mountains. I was mesmerised by the layers of misty blue mountains, the inky clouds and the faint silhouettes of Joshua trees in the foreground. As sunsets go, this was one of the very best. We drove into the twilight listening to rock on the radio, trying to figure out which band had been played the most so far on our trip; both agreeing that Journey and AC/DC were the front-runners. 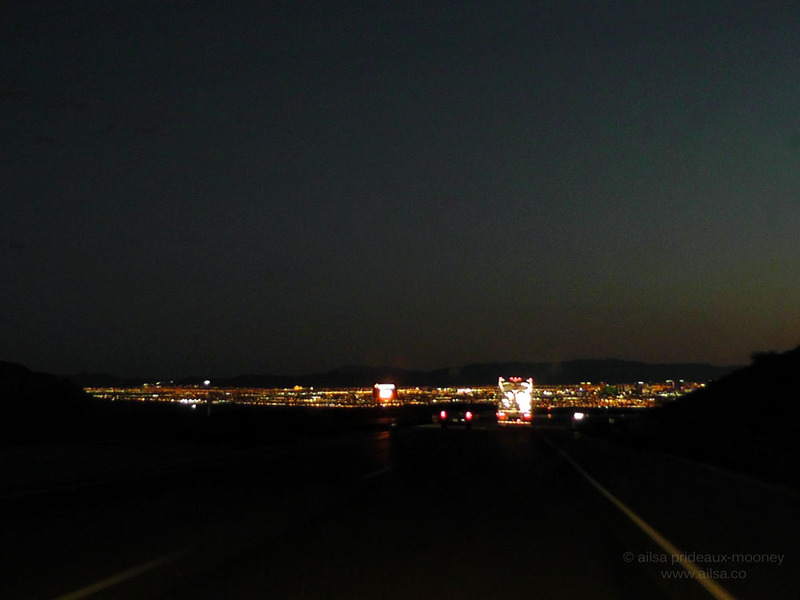 Just before the light disappeared completely, we rounded a bend in the road and the lights of Vegas appeared in the distance. And just like that, we were driving up and down the strip, searching for our hotel. It was quite a culture shock, having been away from big city life for quite some time. 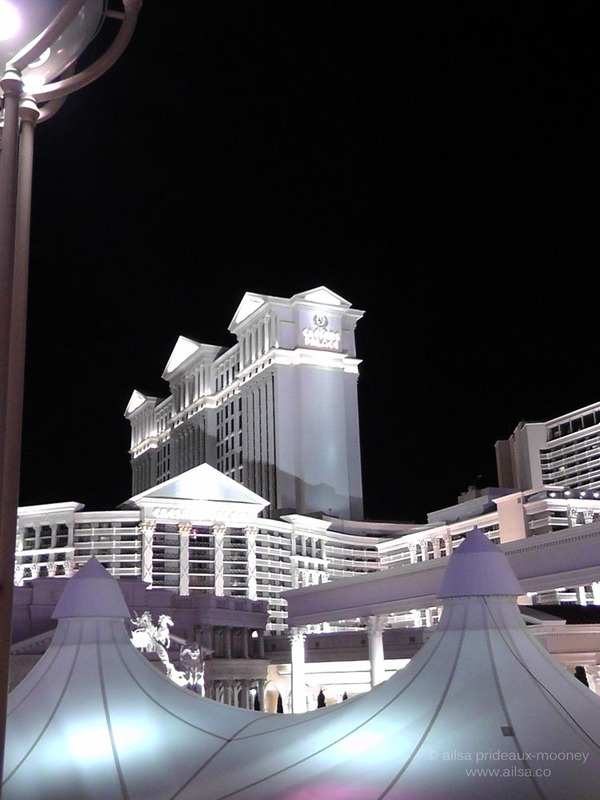 Caesar’s Palace glowed an eerie white in the desert night, palm trees silhouetted against red neon flitted by, the Eiffel Tower popped out of nowhere and a fifty-foot tall Gordon Ramsay stared down at us from the facade of the Arc de Triomphe. Our hotel was a block off the strip and to our delight we discovered we had bagged an entire suite for the princely sum of $24. Two giant beds greeted us when we walked in the door, followed by a dining room, lounge and opulent bathroom. We took turns leaping onto the feather-soft beds; this was infinitely better than a dusty KOA parking lot. Tired did not begin to describe our level of exhaustion, but we hadn’t eaten so after about a half an hour relaxing in the room, we mustered up the strength to drive back along the strip in search of dinner. We parked at Bill’s Gamblin’ Hall and Saloon and took the elevator down to the casino which was filled with the stench of cigar smoke. Vegas casinos are the last bastion for smokers and they seemed to be taking full advantage of it. 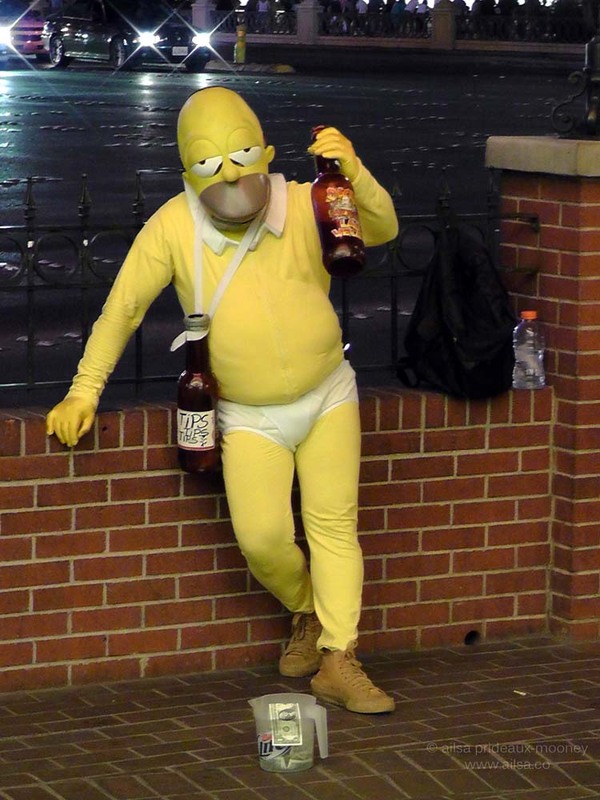 Out on the strip, an underwear-clad Homer Simpson hustled for tips in the sultry desert night. 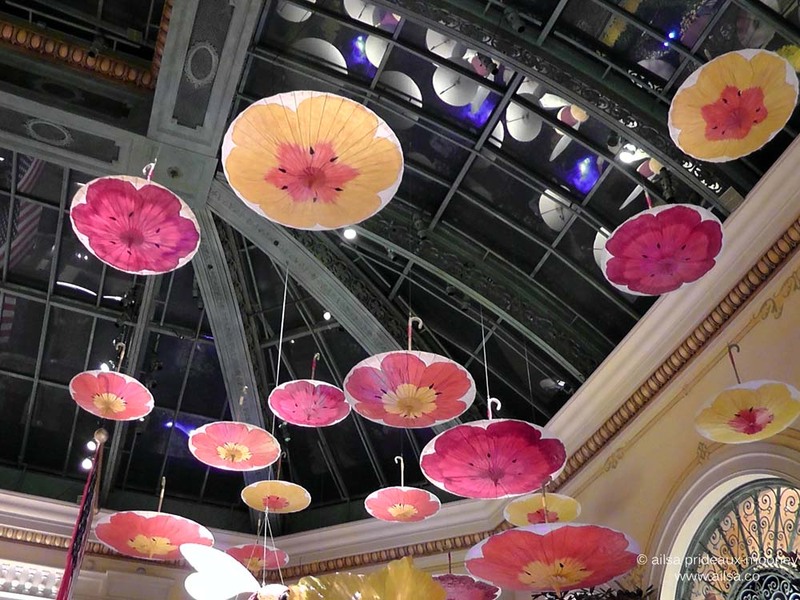 We stood outside the Bellagio for an age waiting for the fountains to erupt but gave up and found a strip-side faux Mexican restaurant for dinner. Ever since we had started out on our road trip, Jill had been dying for Mexican food, but so far, she hadn’t had so much as a taco. A once-handsome man with hollowed-out eyes and dilated pupils took our order and possibly tried to hit on us, but he was so stoned he never really got around to the point. 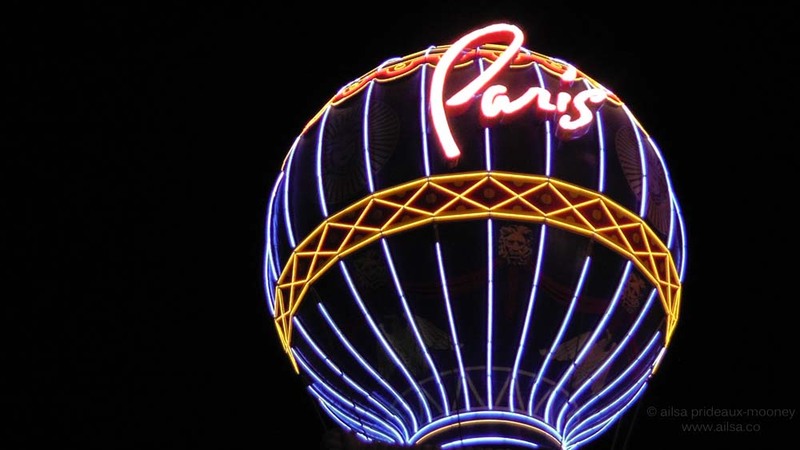 The food was dull but the mojitos were strong enough to topple a buffalo and we sipped them under the neon light of a balloon emblazoned with the word Paris and watched the world go by. The streets were filled with girls sporting corkscrew perms, clothed in lurid pink and lime green. I guess it’s true what they say; what happens in Vegas stays in Vegas, including the Eighties. We said goodbye to our waiter and were already on the sidewalk by the time he registered that we were leaving. Bleary-eyed and dizzy with lack of sleep, we had teetered over the edge of tiredness and now wandered through Vegas like the undead. It was 3am but the streets were so crowded it looked like early evening in any other city and it was freaking Jill out. “Oh my God” she kept gasping. “What is with these people?” A middle-aged couple burst out of a hotel obviously just getting ready to go out somewhere fabulous. The night was only just beginning. 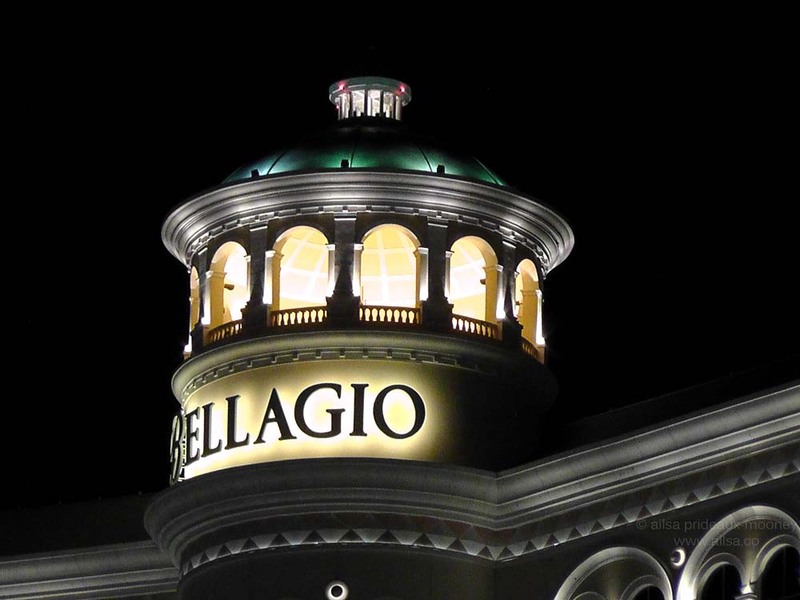 We crossed the street to the Bellagio. Actually, that’s a lie; you don’t cross streets in Vegas; you take an outdoor escalator up to a pedestrian walkway over the road and take another escalator down. If that sounds like too much of an effort, you can opt for an elevator instead. 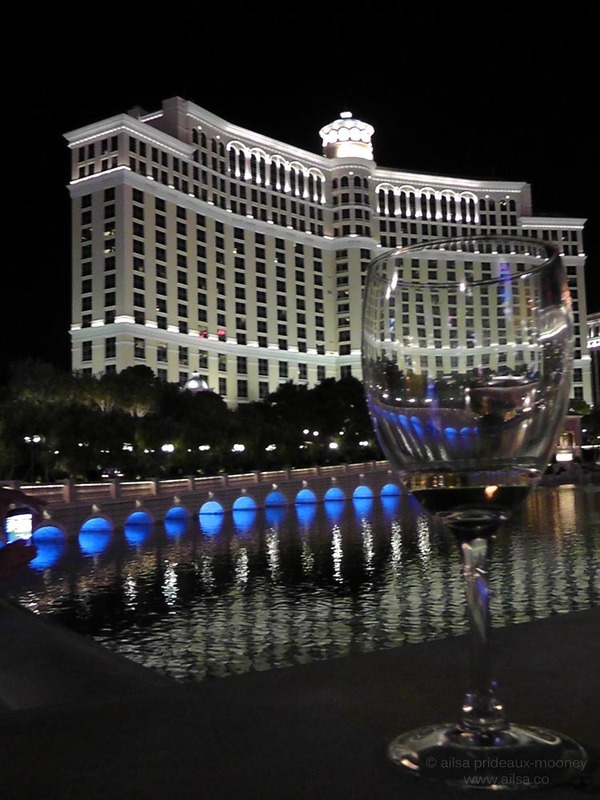 Empty wine glasses littered the walls of the fountain as we walked towards Bellagio’s entrance. I was tempted to take one with me as a souvenir but didn’t think it would survive the remainder of our journey. Inside the doors, the famous Chihuly ceiling hurled big glass flowers from above as janitorial staff cleaned the carpet below. Jill got chatting with one of them who told her that they clean the carpets daily and she came shooting over to tell me. I cracked up laughing because it was classic Jill to get into a conversation about carpet cleaning at 3.30am in the middle of Vegas. I love that about her. 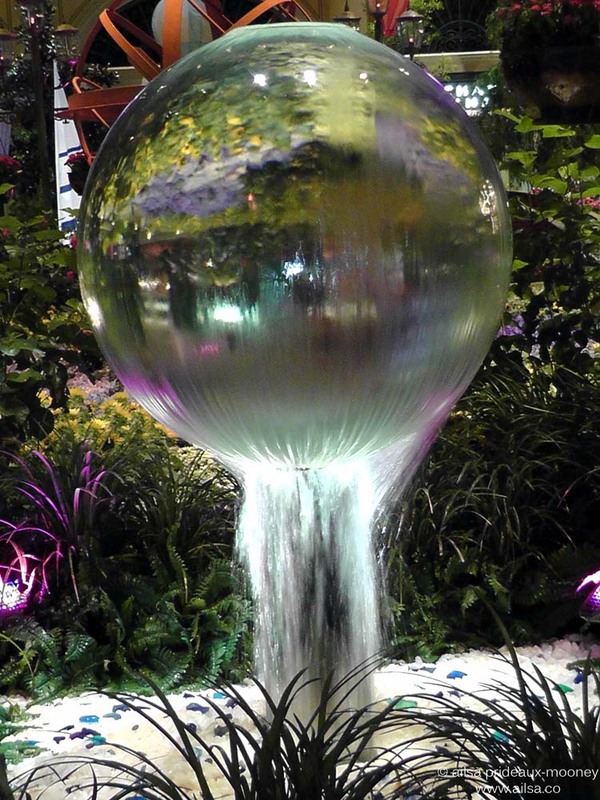 Further into the lobby, it felt like we had gone down a rabbit hole, with all kinds of strange and disturbing crepe birds drifting from the ceiling, balloon and umbrellas suspended overhead and strange mirrored orbs levitating and gushing water. We were both borderline delirious at this point, so we staggered back through the casino in an attempt to leave. Jill got distracted by some people playing blackjack and then decided she wanted to play the slots at least once, but we didn’t have change and couldn’t figure out where to get any so went back to the truck and drove the wrong way down the strip for several miles before realising our mistake and turning back to find our hotel. I don’t actually remember getting out of the truck or entering the hotel; all I remember is the big fluffy bed materialising before my eyes and me collapsing into it. Here’s some footage of today’s epic journey, starting at Zion National Park and ending in Vegas. 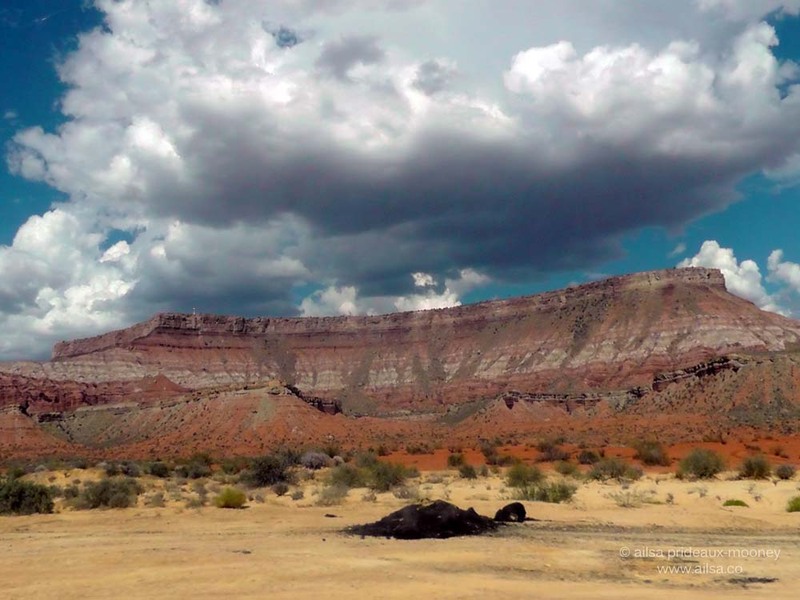 This entry was posted in Arizona, Nevada, Photography, Travel, United States, Utah and tagged humor, nature, photography, photos, pictures, travel, writing. Bookmark the permalink. What a great adventure! Thanks for the ride. Wife and I are considering moving to Nevada, near Vegas. Happy trails! Wow on the shoe tree! I photographed it this summer and was published in the NY Times. See it here http://www.nytimes.com/slideshow/2011/03/03/travel/20110303-WHYWETRAVEL-2.html . I’m so sad that they burned it down! Wow – so glad you let us ride shotgun on this adventure – terrible about the boot tree and thank goodness you didn’t wind up in the Virgin Jail! We have a shoe tree here in Cayman too. Too bad somebody burned it. Great pics, especially the one with the moon. You survived the Arizona Strip, only to land in the Vegas Strip… ahhh, America! Is there anything you don’t do?! Lol how long will you be in the states for? I have a grudging respect for Las Vegas and like you had, I think, the strongest martini (or two) at the top of The Hotel one night in high summer. 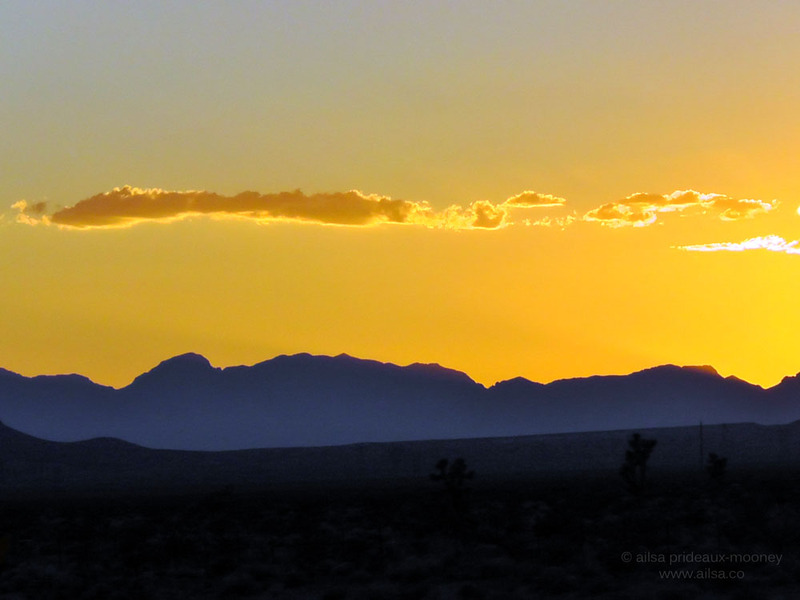 The contrast to Vegas and the awesome scenery that surrounds it is worth a visit in itself. 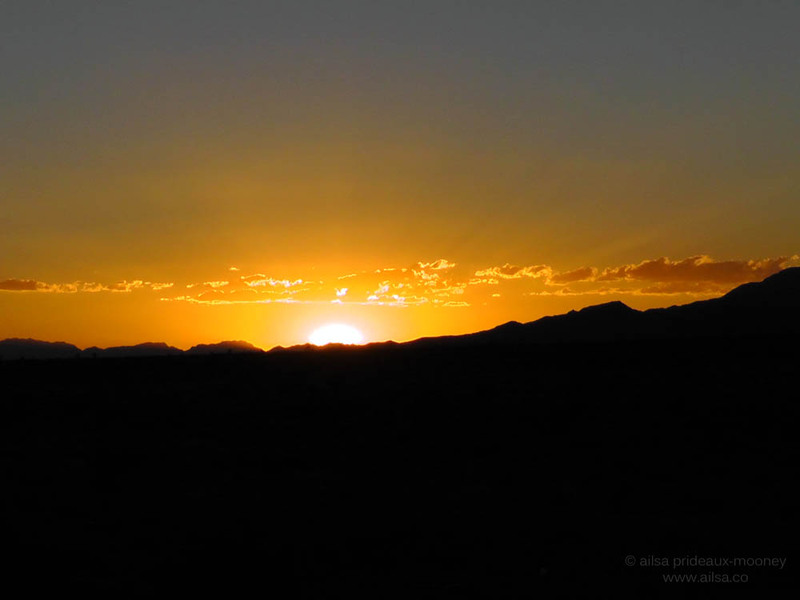 From Zion to Virgin to Las Vegas–quite a whirlwind! No wonder you were delirious by the end. To my surprise, I came to like Las Vegas. 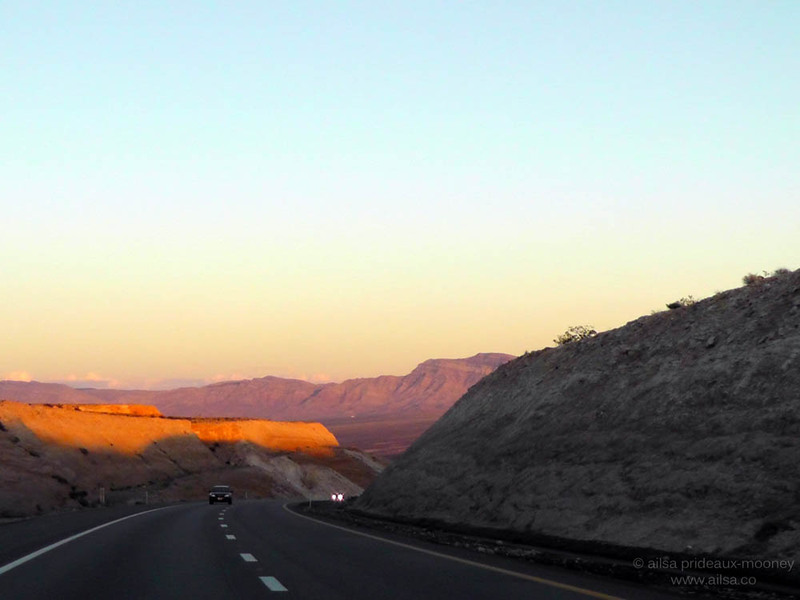 I think part of the charm, though, is how easy it is to get away to the quiet of the desert and bright rocks. 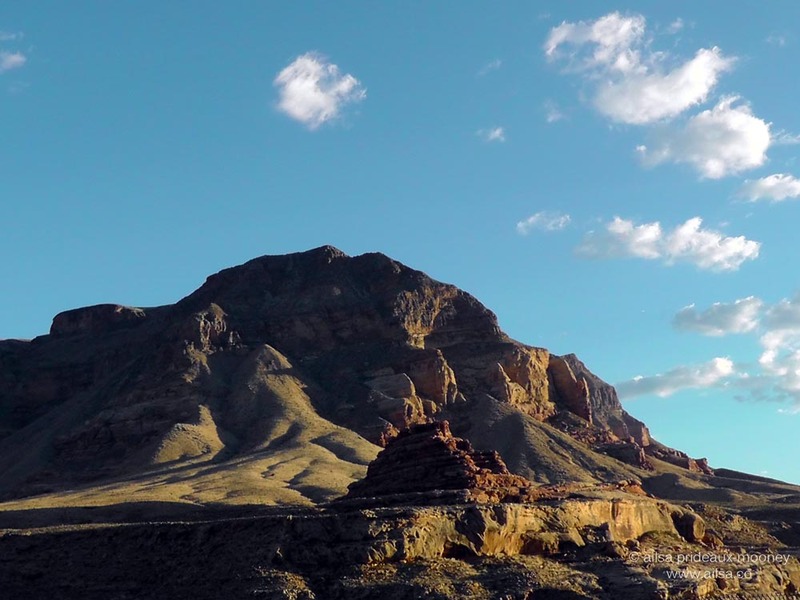 Did you stop by the Red Rock Canyon while you were there by any chance? Your pictures are just fabulous!!! What a nice story, loved the shoe tree and the sunsets! Thanks for sharing! A day of total contrasts! No kidding, it was one extreme to the other. Fantastic fun, though! LOL! Makes me think of a song: (Truckin) “what a long, strange trip it’s been” Great post! Wishing you many more happy adventures! Another thrilling adventure in the life of Ailsa. Sounds like you’re still having fun, and that’s what’s important. There’s a shoe tree in middle-of-nowhere, Oregon, too. Highway 20 is a drive you ought to take sometime. Gorgeous scenery, wildlife, lots of contrasts. And a shoe tree between Harper and Juntura, if I remember correctly. The photo before the sunset is breathtaking, I absolutely love it! An adventure, friendship that withstands the unairconditioned tent and savage ants, and some breathtaking photos to remember it by. Such a contrast between the photos of the country and those of Vegas. 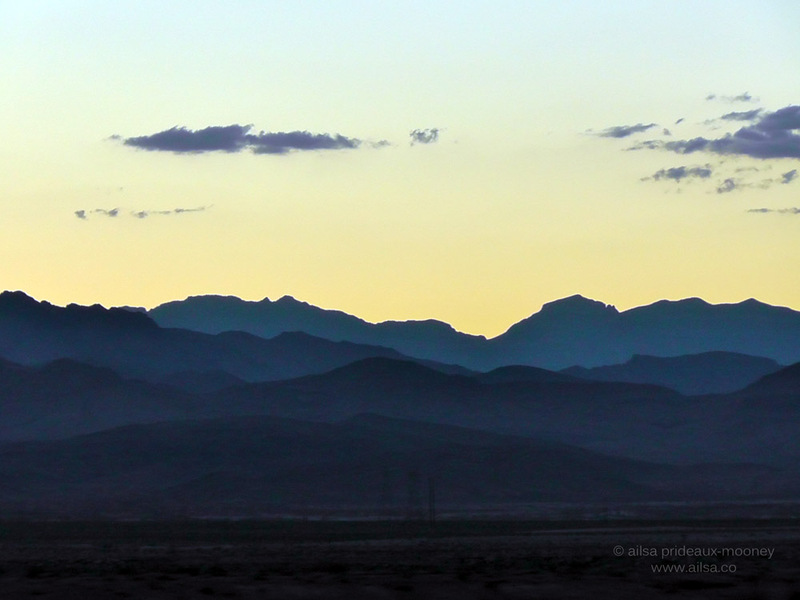 The Arizona, Nevada, Wyoming area in on my List. Beautiful, Beautiful shots, Ailsa. You have some gorgeous photos, Ailsa, both urban and wilderness. Since they dismantled the Star Trek hotel before I got a chance to go there, it is a lot less likely that I am going to visit there any time soon. But I love the neon. Thanks Ailsa, you brought back lots of great memories of Vegas for me. 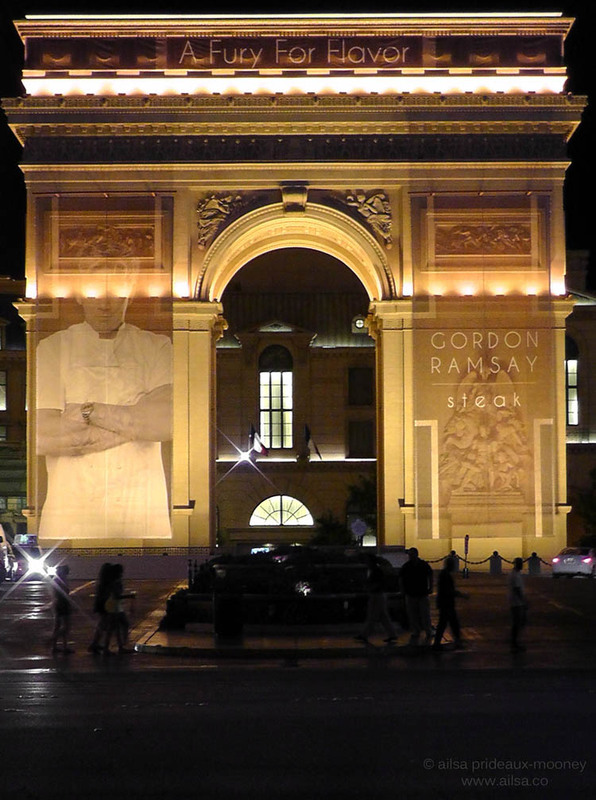 I’m glad the fifty-foot Gordon Ramsey wasn’t there when I visited, though, I think that would have been a bit scary! Great story, terrific photos! Thanks! I just love your adventure, the way you write about it, your photos (loved the town of Virgin photo), and, of course, your videos. But what really amazed me was a motel for $24. Also making a note to return to Zion. Fabulous place. I’m catching up with your blog, Ailsa — your sense of joy, wonder and fun is so evident in your writing and photos — many thanks for sharing your journey! I spent two days in Zion almost exactly a year ago and loved it. Next time try to go in the winter when there are relatively few people around, and don’t miss the drive into the Park along the Virgin River Canyon. I look forward to seeing it again, but not this year. I’ll be in Las Vegas in two weeks for a few days, then head over to Phoenix by way of the Grand Canyon, weather permitting! My only trip to Vegas was spent critisizing all the things theLuxor got wrong Ancient Egyptian-wise. What perfect placement of those lights to stand for Ramsey’s eyes–I feel like lasers are giong to shoot out at me any moment. . .
Haha, that’s too funny, Logan, I didn’t even notice the light placement right where Gordon’s eyes are, brilliant. I know, what a deal, and it was such a luxurious suite too. Maybe it’s time for an invention: portable AC’s good for tents! haha Vegas and the $24 suite must have been the best treat shortly after! 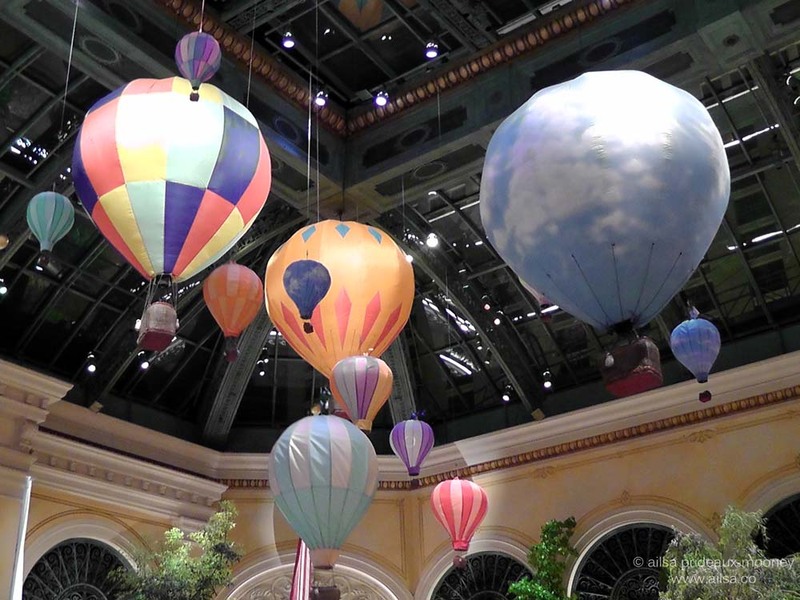 Las Vegas is high up on my bucket list … must because of all the Cirque shows they have there – but I have heard that it’s a magical place. 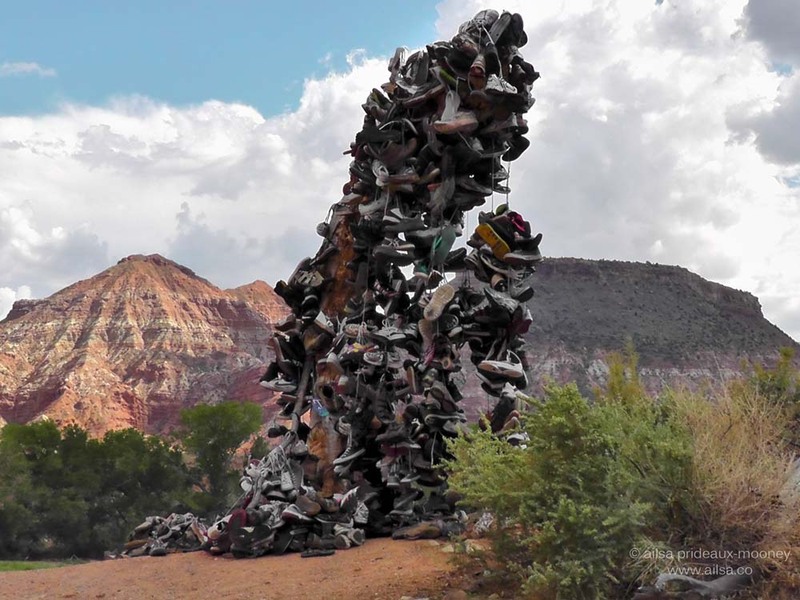 That shoe sculpture is brilliant, what a pity that somebody felt so strongly about putting it on fire – was it made from shoe found out there .. in no man land ???? What a journey you’re on. I don’t understand why .. people have to destroy things. 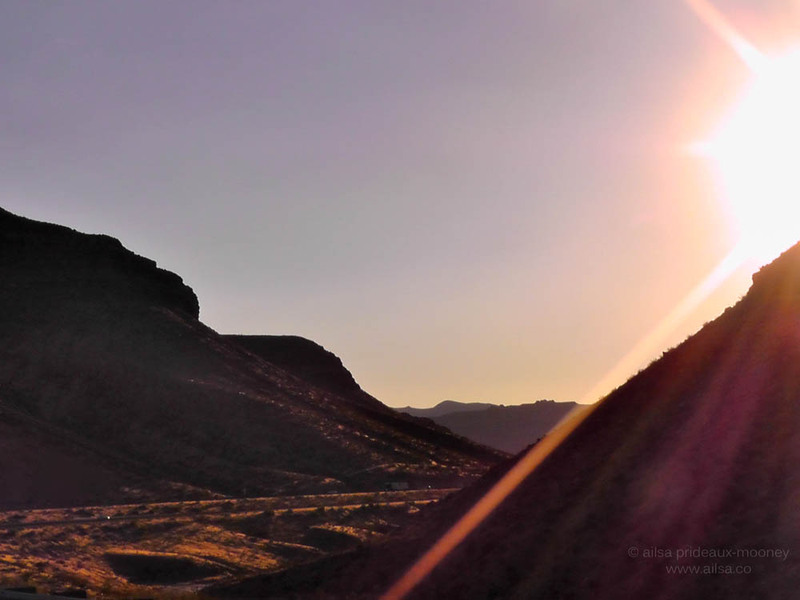 Truly amazing scenery – I particularly like the shots of the sunset! 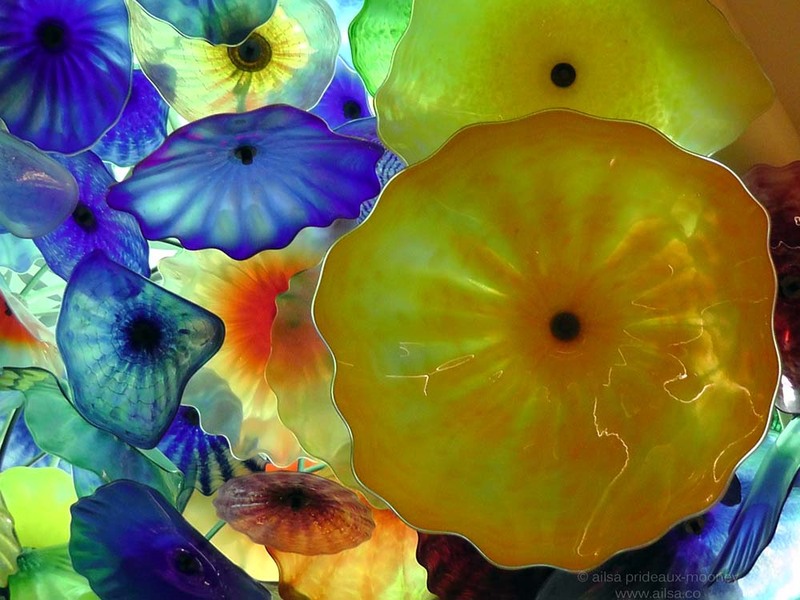 The Chihuli glass is pretty impressive too. I’m willing to bet someone will start a new one, gonerustic. I couldn’t believe when I read that it had burned down shortly after we had seen it. That second shot is simply AMAZING! Love the adventure & expedition, Ailsa!! Thoroughly enjoying this series of yours! Your pictures and stories are making me impatient for our upcoming California road trip. 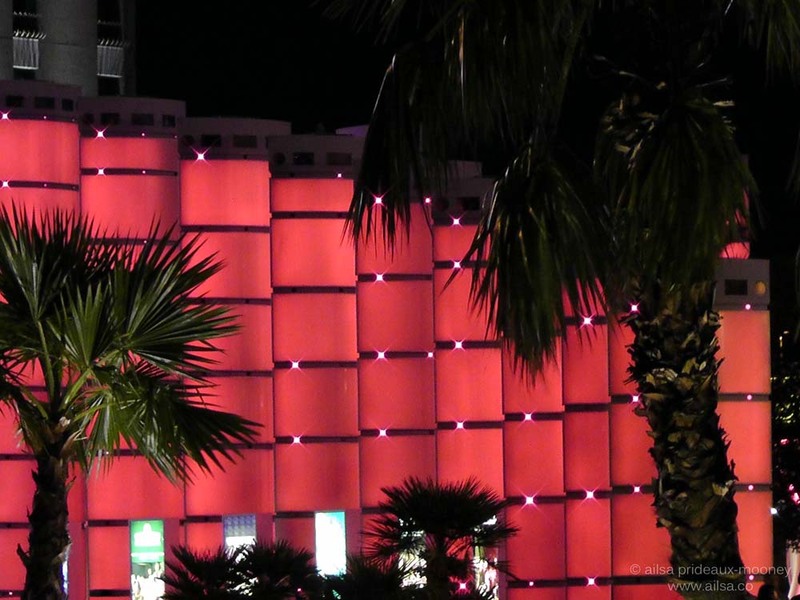 I’d love to fit in another day or so in Vegas to see my favourite hotel ever!!!! Ooh, Livvy, when are you doing your trip, and have you decided where you’re going to go? I love me a good road trip! Wow, I’m more excited all the time! After I leave the Zion area, I’m spending a night in Las Vegas before I head on to TX. Your photos are so gorgeous I can’t wait to see it all in person. These are all fantastic photos – and story of course! Those with many blue shades, those with the setting sun…those with……It’s impossible how gorgeous they all are! Thank you! I always get excited to read your next installment of your trip!! What hotel did you stay at by the way? Ooh, good question, I had to go back and look for the name, it was the Tuscany Hotel and Casino, a block and a half off the main strip. Thanks for the reblog, Mohenjo.